Animals exhale Carbon Dioxide (CO2) and breathe Oxygen (O2), while plants use CO2 and exhale O2. Professional greenhouses often add extra CO2 to increase growth rates. Increased plant growth removes much of the CO2 released into the atmosphere. Between pre-industrial and present times, studies show an average of 15% increase in plant growth rates, with some species increased many times that, e.g. young pine trees. Increased plant growth rates and wider distribution of arable (farmable) land due to warming as well as improved farming practices can solve the so-called overpopulation problem. If much of the data used in the climate models are based on proxy data from tree rings, and growth has been increased by CO2, does that mean that the data is artificially skewed toward “warmer” results? Hmmm. Figure 1. Comparison of Plant Growth at Pre-industrial CO2 levels (295 ppm in pink), at 383 ppm and 600 ppm (in blue) in Dry Wheat, Wet Wheat, Oranges, Orange Trees and Young Pine Trees. Note Percent increases. A. Critics created the “progressive nitrogen limitation hypothesis,” which assumes that increased growth rates of trees would deplete poor soils of nitrogen, thus mediating the positive effects of increased CO2. This is a scenario based on theory, not reality, which stubbornly refuses to support the hypothesis. Many studies show that, contrary to the hypothesis, although roots grow deeper and produce more fine hairs, soil and forest floor are enriched in nitrogen from biological sources, i.e. increased root mass and leaf litter supporting beneficial microbes in the soil. B. One benefit of increased CO2 is that the stomata (openings) of leaves, which take in CO2 and emit water vapor and oxygen, are reduced, leading to less water loss, enhanced water use and improved tolerance to dryer conditions. At elevated CO2 levels, stomata do not need to be open as far to allow sufficient CO2 in for photosynthesis and, as a result, less water is lost through transpiration. In controlled studies, an additional benefit of reduced stomata openings is a reduction of ozone damage. C. The increased rate of growth of plants, from forests to sea algae, results in more of certain cooling aerosols being produced. These include Carbonyl Sulfide (COS) from soil and seas that become highly reflective sulfate in the stratosphere to reflect more solar radiation back into space, Iodo-compounds from sea algae that nucleate clouds to reflect more solar radiation back into space, dimethyl sulfide (DMS), from seas that nucleates clouds and other aerosols such as isoprene from trees with similar effects. D. Hormesis is a phenomenon, commonly seen in medicine and nutrition, where a low concentration or dose results in a positive effect, but a larger dose results in damage. For instance, some salt and water are necessary to good health, but beyond a certain point, ingesting more can be harmful or fatal. The effect of CO2 on plant life appears to be one such system. Increased CO2 obviously benefits plant life, but it is uncertain at what level CO2 might have a detrimental effect on growth. In professional greenhouses and experiments, even ten times the current level is still beneficial. Figure 2. Illustration of how Carbon Dioxide is beneficial to plants through Hormesis. Horizontal Axis is Increasing CO2 level. Example: Phillips, R.P., Finzi, A.C. and Bernhardt, E.S. 2011. “Enhanced root exudation induces microbial feedbacks to N cycling in a pine forest under long-term CO2 fumigation”. Ecology Letters 14: 187-194. 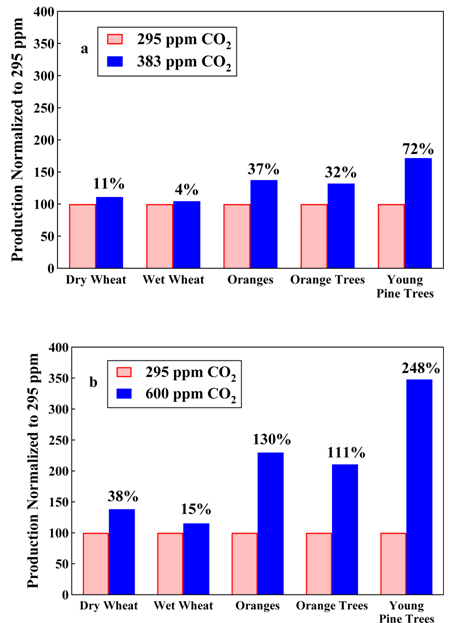 See review article of research papers: “Responses of agricultural crops to free-air CO2 enrichment” Kimball, B.A., Kobayashi, K. and Bindi, M., Advances in Agronomy 77: 293-368 2002.